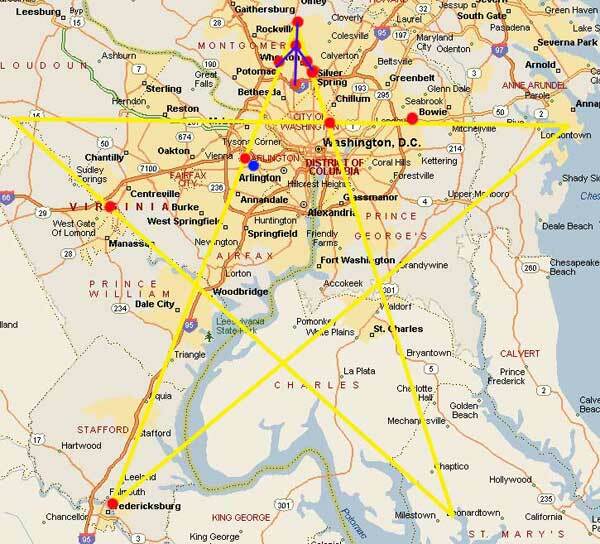 FALLS CHURCH SHOOTING IN "BELTWAY SNIPER CASE" FALLS ON THE PENTAGRAM LINE RUNNING FROM FREDERICKSBURG TO ROCKVILLE! Title: FALLS CHURCH SHOOTING IN "BELTWAY SNIPER CASE" FALLS ON THE PENTAGRAM LINE RUNNING FROM FREDERICKSBURG TO ROCKVILLE! Subtitle: When we plotted the location of this latest shooting, we discovered that Falls Church downtown falls directly on this Pentagram line. The actual shooting was 1.2 miles away. If the shooter meant to mark Falls Church on this map, he lined this shooting location perfectly on the line of the Pentagram. NEWS BRIEF: "Woman Shot Dead Outside Fairfax Store: Seven Corners Center Attack Is Similar to Sniper Pattern", By Martin Weil and Petula Dvorak, Washington Post Staff Writers Washingtonpost.com, October 15, 2002. "A woman was shot dead last night outside a Home Depot store in Fairfax County in an attack that appeared similar to a series of sniper shootings that have killed eight people and spread fear across the Washington region for nearly two weeks. The shooting in the Falls Church area occurred about 9:15 p.m. at the Seven Corners Shopping Center, which is bounded by major Northern Virginia traffic arteries, and it prompted police to set up checkpoints on principal roads for miles around. Traffic came to a standstill." In our last article on this subject, NEWS1714, where we revealed the that these shootings form a Satanic Pentagram on the ground, we expressed hope upon hope that these shootings had ended with the 11th shot on October 11. We were probably thinking with our heart, hoping against hope that no more senseless murders occur just to further an evil occult goal. But, another person has now died, from Shot #12. Let us now update our Shooting Record with this latest shooting. 1. -- 5:20 p.m. Wednesday, Oct. 2: Windows shot at Maryland craft store. No one hurt. 2. -- 6:04 p.m. Wednesday: Oct 2: James D. Martin, 55, of Silver Spring, Md., killed in Maryland grocery store parking lot. 3. -- 7:41 a.m. Thursday, Oct. 3: James L. "Sonny" Buchanan, 39, of Arlington, Va., killed while cutting grass at Maryland auto dealership. 4. -- 8:12 a.m. Thursday: Oct 3: Taxi driver Prem Kumar Walekar, 54, of Olney, Md., killed at Maryland gas station. 5. -- 8:37 a.m. Thursday: Oct 3: Sarah Ramos, 34, of Silver Spring, Md., killed outside Maryland post office. 6. -- 9:58 a.m. Thursday: Oct 3: Lori Ann Lewis-Rivera, 25, of Silver Spring, Md., killed as she vacuumed her van at Maryland gas station. 7. -- 9:15 p.m. Thursday: Oct 3: Pascal Charlot, 72, of Washington, D.C, killed while standing on a street in the nation's capital. 8. -- 2:30 p.m. Friday, Oct. 4: 43-year-old woman wounded in craft-store parking lot in Fredericksburg, Va.
9. -- 8:09 a.m. Monday, Oct. 7: 13-year-old boy wounded as he is dropped off at Bowie, Md., school. 10. -- 8:15 p.m. Wednesday, Oct. 9: Dean Harold Meyers, 53, of Gaithersburg, Md., shot dead at a gas station near Manassas, Va., about 30 miles west of Washington, D.C.
12. -- 9:15 p.m., Monday, Oct 14, Falls River Home Depot, Junction of Rts 50 and 7. Falls Church, VA 22044, (703)534-9580. Using a sophisticated map program that is compatible with Global Positioning Satellites, we exactly located the shooting, and depicted it with the blue dot. However, this blue dot was about 1.2 miles from the line on the pentagram running Southwest [FREDERICKSBURG] to Northeast [ROCKVILLE]. Then, we discovered that this shooting location was also precisely 1.25 miles from downtown Falls Church, Virginia, a location we marked with a red dot. In other words, downtown Falls Church falls exactly, precisely, right on the pentagram line! If the person(s) who have developed this plan and are carrying it out, wanted to mark "Falls Church" on the Pentagram with this #12 shot, they came mighty close with the Falls Church Home Depot. It is highly likely that the shooter is given some parameters within which he can work, depending upon the circumstances he encounters when he arrives at the target location. For example, if the #1 preferred spot to make his shot is crawling with police, he undoubtedly has the option of moving to his #2 spot, and if that is not suitable, he can move to his #3 spot, and so forth. The #2 and #3 spots might not fall exactly on the line, but they are close enough to cause the shooting location to be counted as being on the desired point on the map. This may have been the reason the actual shooting was 1.2 miles from the yellow line, while the location "Falls Church, Virginia" was still reported as the shooting location. One other factor to consider is the width of the line. We have drawn a very narrow line on this map, but the actual line on the ground may be a mile wide, or even two miles wide. We simply do not know the parameters by which the shooter's handlers are running this operation! The one unassailable fact is that downtown Falls Church is right smack on the pentagram line. First, the first six two shots on October 2 occurred on a Satanic celebration to the Hindu Goddess, Kali [Read NEWS1710 for full details]. Then, we learned several days later that police had discovered a "Death" Tarot Card - #13 in the Tarot Deck -- at the scene of the Bowie Middle School shooting in which a 13-year-old boy was shot and seriously injured. We took this development as confirmation of our original belief that these shootings were based in the occult, in Black Magick Satanism to be exact. Finally, when Shot #11 occurred on October 11, at Fredericksburg, we noted that this was the second shot at this location, and asked ourselves why this location needed to be emphasized in this manner. A former Satanist suggested that the shooter's handlers wanted to emphasize that this pentagram being drawn on the ground was a Left-hand Path operation -- in other words, a Black Magick operation. We think she was right. Now, we arrive at the subject of Michael's Craft stores. Several of the shots occurred at a Michael's, including the very first shot. We think that it is more likely than not that a play is being made on the word, 'craft'. This entire operation has been proven by these other factors, mentioned above, to be a Satanic operation. Since the practice of being a witch or wizard is considered an artform, many times it is called "The Craft"! 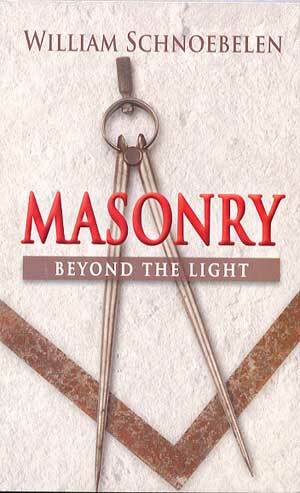 In fact, the most ancient of words used to describe the practice of Satanism is "The Craft". Thus, we have the combined word, "Witchcraft". * "power shall be mighty" -- great and mighty power flows from Satan when a Black Magick ritual is properly performed. * "destroy wonderfully" -- The enemies of a Black Magick witch are usually destroyed mightily, unless they are a Born Again Christian! * "cause craft to prosper in his hand" -- Black Magick Witchcraft. This passage foretells that the religion of Antichrist will be Black Magick Witchcraft! Thus, we think it highly likely that this eerie anomaly of choosing sites that have a Michael's Craft store in the vicinity is another occult "calling card" like the Death Tarot Card, and like beginning this shooting rampage on the first day of the Satanic holy celebration period of Kali. Fellow occultists will understand the meaning immediately, while the rest of us "Muggles" will be left scratching our heads in wonder and amazement. We have now have 12 shootings along a very identifiable set of lines that form a pentagram. What are the probabilities that these 12 shootings that precisely fall into a Devil's Pentagram, have occurred by accident? If Cutting Edge Ministries has any mathematicians in our reading audience, we would appreciate you emailing us with the calculations that would show the probabilities against these 12 shootings occurring on these precise lines by accident. During our 1999 research and analysis of the Clinton-era school shootings, eight of which occurred precisely on two lines that intersected in Hope, Arkansas, a mathematician wrote in to show us that eight shootings along precise lines carried a negative probability of 1 x 4.03 trillion. We would like to see the odds on 12 shooting locations along these precise lines being an accident. Truly, these shootings are communicating a very specific message to the American people. Since the first six shots formed an Antichrist symbol called the "Broken Cross", and since these six shootings were laid on a Satanic triangular altar [Read NEWS1714 for full details], we feel the message is that the time is nigh for the beginning of the persecution of the true, Fundamental Christian Church. These several occult "calling cards" are merely letting us know what force will be behind the coming persecution.